in the presence of her dead son. blunt, double shot of Christian Brothers brandy. son's damp face up a desolate flight of stairs. my mind like contractions three minutes apart. From The Fateful Apple (Hawkins Publishing Group, 2014). Venus Thrash was a finalist in the 2012 Jean Feldman and 2009 Arktoi Books Poetry Prizes. Her debut collection of poetry, The Fateful Apple (Hawkins Publishing Group), was published in March 2014. Her poetry is published in The Beloit Poetry Journal, Split This Rock, Beltway Quarterly, Torch, Gargoyle, November 3rd Club, and the Arkansas Review. 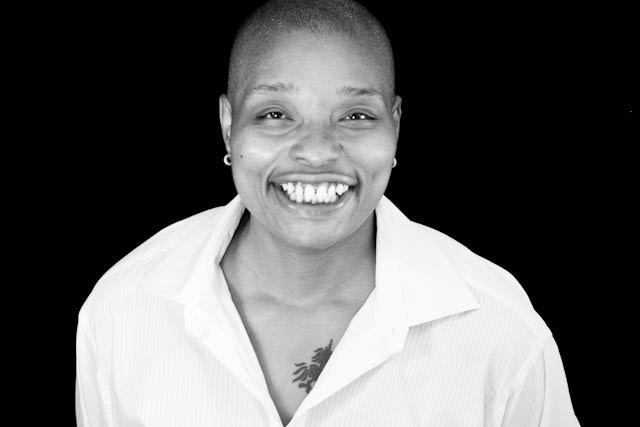 She has been a featured reader at Split This Rock Poetry Conference, the Studio Museum in Harlem, The Schomburg Center for Research in Black Culture, Virginia Festival of the Book, and The Library of Congress. She teaches creative writing at Trinity Washington University, and is the mom to seven year old son, Daniel. She is completing The Soul of a Man, a short story collection, and a second poetry manuscript, Misanthrope. If you plan to submit to our Virtual Open Mic: Poems that Resist Police Brutality and Demand Racial Justice the mic is still hot. Thank you who have, and who yet will share this witness with us. We'll close the call at midnight on January 21, and will deliver all the open mic poems to the Department of Justice on January 23, 2015.